Quickly and easily view product specs, compare various solutions, and print out select product information. Download the latest Marvell drivers for your specific device or application. Product documentation and related resources for Marvell NDA customers. Marvell offers a collaborative fast-paced environment where innovative ideas can really make a difference. If you want to achieve great things, then we want to talk with you. The data center networking landscape is set to change dramatically. More adaptive and operationally efficient composable infrastructure will soon start to see significant uptake, supplanting the traditional inflexible, siloed data center arrangements of the past and ultimately leading to universal adoption. Composable infrastructure takes a modern software-defined approach to data center implementations. 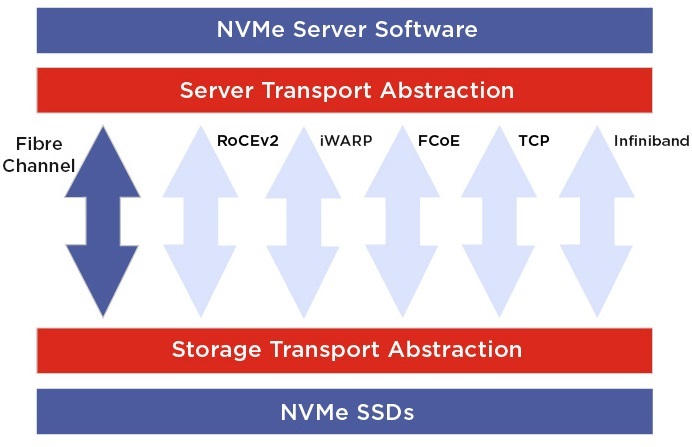 This means that rather than having to build dedicated storage area networks (SANs), a more versatile architecture can be employed, through utilization of NMVe and NVMe-over-Fabric protocols. Whereas previously data centers had separate resources for each key task, composable infrastructure enables compute, storage and networking capacity to be pooled together, with each function being accessible via a single unified fabric. This brings far greater operational efficiency levels, with better allocation of available resources and less risk of over provisioning — critical as edge data centers are introduced to the network, offering solutions for different workload demands. Composable infrastructure will be highly advantageous to the next wave of data center implementations though the increased degree of abstraction that comes along presents certain challenges — these are mainly in terms of dealing with acute network congestion — especially in relation to multiple host scenarios. Serious congestion issues can occur, for example, when there are several hosts attempting to retrieve data from a particular part of the storage resource simultaneously. Such problems will be exacerbated in larger scale deployments, where there are several network layers that need to be considered and the degree of visibility is thus more restricted. There is a pressing need for a more innovative approach to data center orchestration. A major streamlining of the network architecture will be required to support the move to composable infrastructure, with fewer network layers involved, thereby enabling greater transparency and resulting in less congestion. This new approach will simplify data center implementations, thus requiring less investment in expensive hardware, while at the same time offering greatly reduced latency levels and power consumption. Further, the integration of advanced analytical mechanisms is certain to be of huge value here as well — helping with more effective network management and facilitating network diagnostic activities. Storage and compute resources will be better allocated to where there is the greatest need. Stranded capacity will no longer be a heavy financial burden. Through the application of a more optimized architecture, data centers will be able to fully embrace the migration to composable infrastructure. Network managers will have a much better understanding of what is happening right down at the flow level, so that appropriate responses can be deployed in a timely manner. Future investments will be directed to the right locations, optimizing system utilization. Whether it is the aesthetics of the iPhone or a work of art like Monet’s ‘Water Lillies’, simplicity is often a very attractive trait. I hear this resonate in everyday examples from my own life – with my boss at work, whose mantra is “make it simple”, and my wife of 15 years telling my teenage daughter “beauty lies in simplicity”. For the record, both of these statements generally fall upon deaf ears. The Non-Volatile Memory over PCIe Express (NVMe) technology that is now driving the progression of data storage is another place where the value of simplicity is starting to be recognized. In particular with the advent of the NVMe-over-Fabrics (NVMe-oF) topology that is just about to start seeing deployment. The simplest and most trusted of Ethernet fabrics, namely Transmission Control Protocol (TCP), has now been confirmed as an approved NVMe-oF standard by the NVMe Group. Just to give a bit of background information here, NVMe basically enables the efficient utilization of flash-based Solid State Drives (SSDs) by accessing it over a high-speed interface, like PCIe, and using a streamlined command set that is specifically designed for flash implementations. Now, by definition, NVMe is limited to the confines of a single server, which presents a challenge when looking to scale out NVMe and access it from any element within the data center. This is where NVMe-oF comes in. All Flash Arrays (AFAs), Just a Bunch of Flash (JBOF) or Fabric-Attached Bunch of Flash (FBOF) and Software Defined Storage (SDS) architectures will each be able to incorporate a front end that has NVMe-oF connectivity as its foundation. As a result, the effectiveness with which servers, clients and applications are able to access external storage resources will be significantly enhanced. A series of ‘fabrics’ have now emerged for scaling out NVMe. The first of these being Ethernet Remote Direct Memory Access (RDMA) – in both its RDMA over Converged Ethernet (RoCE) and Internet Wide-Area RDMA Protocol (iWARP) derivatives. It has been followed soon after by NVMe-over-Fiber Channel (FC-NVMe), and then ones based on FCoE, Infiniband and OmniPath. But with so many fabric options already out there, why is it necessary to come up with another one? Do we really need NVMe-over-TCP (NVMe/TCP) too? Well RDMA (whether it is RoCE or iWARP) based NVMe fabrics are supposed to deliver the extremely low level latency that NVMe requires via a myriad of different technologies – like zero copy and kernel bypass – driven by specialized Network Interface Controller (NICs). However, there are several factors which hamper this, and these need to be taken into account. Firstly, most of the earlier fabrics (like RoCE/iWARP) have no existing install base for storage networking to speak of (Fiber Channel is the only notable exception to this). For example, of the 12 million 10GbE+ NIC ports currently in operation within enterprise data centers, less than 5% have any RDMA capability (according to my quick back of the envelope calculations). The most popular RDMA protocol (RoCE) mandates a lossless network on which to run (and this in turn requires highly skilled network engineers that command higher salaries). Even then, this protocol is prone to congestion problems, adding to further frustration. Finally, and perhaps most telling, the two RDMA protocols (RoCE and iWARP) are mutually incompatible. Unlike any other NVMe fabric, the pervasiveness of TCP is huge – it is absolutely everywhere. TCP/IP is the fundamental foundation of the Internet, every single Ethernet NIC/network out there supports the TCP protocol. With TCP, availability and reliability are just not issues to that need to be worried about. Extending the scale of NVMe over a TCP fabric seems like the logical thing to do. NVMe/TCP is fast (especially if using Marvell FastLinQ 10/25/50/100GbE NICs – as they have a build-in full offload for NVMe/TCP), it leverages existing infrastructure and keeps things inherently simple. That is beautiful prospect for any technologist and is also attractive to company CIOs worried about budgets too. So, once again, simplicity wins in the long run! Today, we are at the peak of technology product availability with the releases of the new iPhone models, Alexa enabled devices and more. In the coming days, there will be numerous international consumer OEMs preparing new offerings as we approach the holiday selling season. Along with the smartphones, voice assistant enabled smart speakers and deep learning wireless security cameras, many devices and appliances are increasingly geared toward automating the home, the office and the factory. These devices are powered by application microcontroller units (MCUs) with embedded wireless connectivity to help users to remotely control and operate them via phone apps, voice or even through mere presence. This is part of an industry trend of pushing intelligence into everyday things. According to analyst firm Techno Systems Research1, this chipset market grew by more than 60% over the course of the last year and is likely to continue this high rate of growth. The democratization of wireless connectivity intellectual property and the continuing shift of semiconductor design and development to low cost regions is helping give rise to new industry players. In order to help customers differentiate in this highly competitive market, Marvell has announced the 88MW320/322 low-power Wi-Fi microcontroller SoC. This chipset is 100% pin-compatible and software compatible with the existing 88MW300/302 based designs. Although the newly released microcontroller is cost-optimized, there are several key hardware and software enhancements in this chipset. Support for extended industrial temperature operation, from -400 C through to 1050 C has been added. Unlike its predecessor, the 88MW320/322 can be implemented into more challenging application areas – such as LED lighting and industrial automation. No RF specific changes have been made within the silicon, so the minimum and maximum RF performance parameters remain the same as before. However, other fixes made have helped improve typical RF performance as reported by some of our customers when evaluating samples. Since there was no change in form, fit or function, the external RF interface remains the same as well. This enables customers to leverage existing 88MW300/302 module and device level regulatory certification on 88MW320/322. A hardware security feature has also been incorporated that allows customers to uniquely tie the chipset to the firmware running on it. This helps prevent counterfeit software to run on the chipset. This chipset is supported by the industry-leading Marvell EZ-Connect SDK for Apple’s new Advanced Development Kit (ADK) and Release 13 HomeKit Accessory Protocol SDK (R13 HAPSDK) with software-based authentication (SoftAuth), Amazon’s AWS IoT and other third-party cloud platforms. The Apple SoftAuth support now allows customers to avoid the cost and hassle of adding the MFi authentication chip, which was previously required to get HomeKit certification. On the applications side, we have added support for the Alexa Voice Services library. With MP3 decoder and OAUTH2 modules integrated on our SDK, our solution now allows customers to add an external audio-codec chipset to offer native voice command translation for basic product control functions. As previously announced, we continue to partner with Dialog Semiconductor to offer support for BLE with shared antenna managed coexistence software with our Wi-Fi on 88MW320/322. Several of our module vendor partners have announced support for this chipset in standalone and Wi-Fi + BLE combo configurations. You can find a complete list of modules supporting this chipset on the Marvell Wireless Microcontrollers page. The 88MW320/322 has been sampling to customers for a few months now and is currently shipping. The product comes in 68-pin QFN package (88MW320) and 88-pin QFN package (88MW322) formats. It is available in commercial, extended, industrial and extended industrial temperature ranges in both tray and tape and reel configurations. Watch this space for future announcements as we extend the availability of Marvell’s solutions for the smart home, office and factory to our customers through our catalog partners. The goal is to enable our wireless microcontroller solutions with easy to install one-click software that allows smaller customers to use our partner reference designs to develop their form factor proof of concept designs with hardware, firmware, middleware, cloud connectivity software, collateral and application support from a single source. This will free up their resources so that they can focus on what is most important to them – which is to work on application software and differentiation. The best is yet to come. As the industry demands solutions with higher levels of integration at ever lower power to allow for wireless products with several months and even years of battery life, you can count on Marvell to innovate to help meet customer needs. For example, the 802.11ax standard specification is not just for high efficiency and high throughput designs, it also offers provisions for low power, long battery life designs. 20MHz only channel operation in the 5GHz band and features such as target wake time (TWT), which helps extend the sleep cycle of devices; dual sub-carrier modulation (DCM), which helps extend the wireless range; uplink and downlink OFDMA, all contribute to make the next generation of devices worth waiting for. 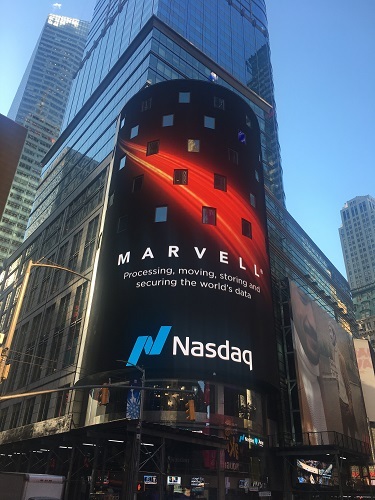 Marvell shared its mission and focus on driving the core technology to enable the global network infrastructure at its recent investor day. This was followed up with an appearance at Nasdaq, where Matt Murphy, president and CEO of the company, rang the bell to open the stock exchange. 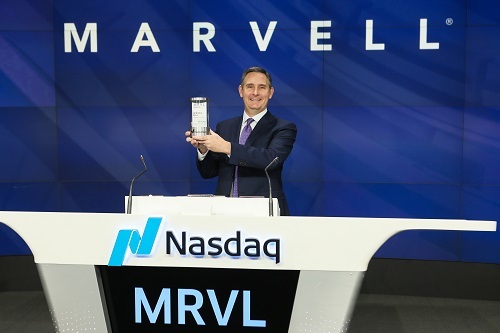 At both of these events in New York City, Marvell shared how far the company has come, where it was going, and reaffirmed its mission: To provide semiconductor solutions that process, move, store and secure the world’s data faster and more reliably than anyone else. The world has become more connected and intelligent than ever, and the global network has also evolved at an astonishing rate. It’s imperative that the semiconductor industry advances even quicker to keep up with these new technology trends and stay relevant. Marvell recognizes that its customers, at the core or on the edge, face the daunting challenge of delivering solutions for this ever-changing world – today. With both the breadth and depth of technology expertise, Marvell offers the critical technology elements — storage, Ethernet, Arm® processors, security processors and wireless connectivity — to drive innovation in the industry. With the Cavium acquisition, the company retains its strong and stable foothold while competing more aggressively and innovating faster to serve customers better. For Marvell the future isn’t a distant challenge: it is here with us now, evolving at an accelerated pace. Marvell is enabling new technologies such as 5G, disrupting new Flash platform solutions for the data center, revolutionizing the in-car network, and developing new compute architectures for artificial intelligence, to name a few. Bringing the most complete infrastructure portfolio of any semiconductor company, Marvell is more than ready to continue on its amazing journey, and have its customers and partners alongside it on the cutting-edge—today, tomorrow and beyond. Converging network and storage I/O onto a single wire can drive significant cost reductions in the small to mid-size data center by reducing the number of connections required. Fewer adapter ports means fewer cables, optics and switch ports consumed, all of which reduce OPEX in the data center. Customers can take advantage of converged I/O by deploying Converged Network Adapters (CNA) that provide not only networking connectivity, but also provide storage offloads for iSCSI and FCoE as well. Just recently, HPE has introduced two new CNAs based on Marvell® FastLinQ® 41000 Series technology. The HPE StoreFabric CN1200R 10GBASE-T Converged Network Adapter and HPE StoreFabric CN1300R 10/25Gb Converged Network Adapter are the latest additions in HPE’s CNA portfolio. These are the only HPE StoreFabric CNAs to also support Remote Direct Memory Access (RDMA) technology (concurrently with storage offloads). As we all know, the amount of data being generated continues to increase and that data needs to be stored somewhere. Recently, we are seeing an increase in the number of iSCSI connected storage devices in mid-market, branch and campus environments. iSCSI is great for these environments because it is easy to deploy, it can run on standard Ethernet, and there are a variety of new iSCSI storage offerings available, like Nimble and MSA all flash storage arrays (AFAs). One challenge with iSCSI is the load it puts on the Server CPU for storage traffic processing when using software initiators – a common approach to storage connectivity. To combat this, Storage Administrators can turn to CNAs with full iSCSI protocol offload. Offloading transfers the burden of processing the storage I/O from the CPU to the adapter. As Figure 1 shows, Marvell driven testing shows that CPU utilization using H/W offload in FastLinQ 10/25GbE adapters can reduce CPU utilization by as much as 50% compared to an Ethernet NIC with software initiators. This means less burden on the CPU, allowing you to add more virtual machines per server and potentially reducing the number of physical servers required. 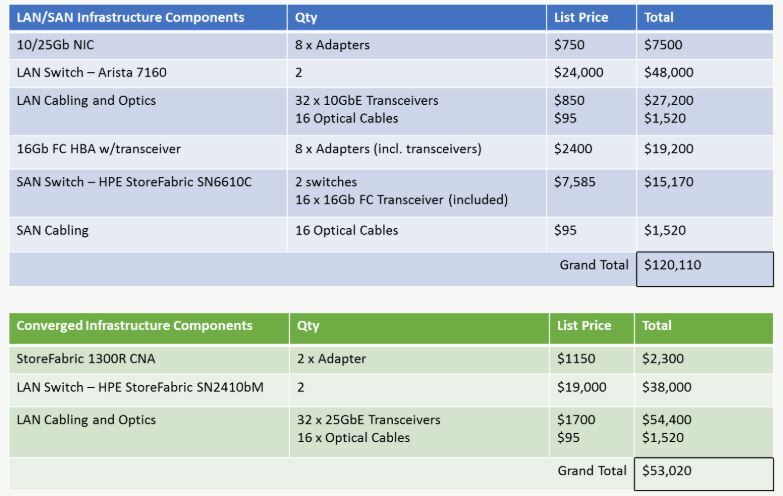 A small item like an intelligent I/O adapter from Marvell can provide a significant TCO savings. Another challenge has been the latency associated with Ethernet connectivity. This can now be addressed with RDMA technology. iWARP, RDMA over Converged Ethernet (RoCE) and iSCSI over Ethernet with RDMA (iSER) all allow for I/O transactions to be performed directly from the memory to the adapter, bypassing the software kernel in the user space of the O/S. This speeds transactions and reduces the overall I/O latency. The result is better performance and faster applications. The new HPE StoreFabric CNAs become the ideal devices for converging network and iSCSI storage traffic for HPE ProLiant and Apollo customers. The HPE StoreFabric CN1300R 10/25GbE CNA supports plenty of bandwidth that can be allocated to both the network and storage traffic. In addition, with support for Universal RDMA (support for both iWARP and RoCE) as well as iSER, this adapter provides significantly lower latency than standard network adapters for both the network and storage traffic. The HPE StoreFabric 1300R also supports a technology Marvell calls SmartAN™, which allows the adapter to automatically configure itself when transitioning between 10GbE and 25GbE networks. This is key because at 25GbE speeds, Forward Error Correction (FEC) can be required, depending on the cabling used. To make things more complex, there are two different types of FEC that can be implemented. To eliminate all the complexity, SmartAN automatically configures the adapter to match the FEC, cabling and switch settings for either 10GbE or 25GbE connections, with no user intervention required. When budget is the key concern, the HPE StoreFabric CN1200R is the perfect choice. Supporting 10GBASE-T connectivity, this adapter connects to existing CAT6A copper cabling using RJ-45 connections. This eliminates the need for more expensive DAC cables or optical transceivers. The StoreFabric CN1200R also supports RDMA protocols (iWARP, RoCE and iSER) for lower overall latency. Why converge though? It’s all about a tradeoff between cost and performance. If we do the math to compare the cost of deploying separate LAN and storage networks versus a converged network, we can see that converging I/O greatly reduces the complexity of the infrastructure and can reduce acquisition costs by half. There are additional long-term cost savings also, associated with managing one network versus two. In this pricing scenario, we are looking at eight servers connecting to separate LAN and SAN environments versus connecting to a single converged environment as shown in figure 2. The converged environment price is 55% lower than the separate network approach. The downside is the potential storage performance impact of moving from a Fibre Channel SAN in the separate network environment to a converged iSCSI environment. The iSCSI performance can be increased by implementing a lossless Ethernet environment using Data Center Bridging and Priority Flow Control along with RoCE RDMA. 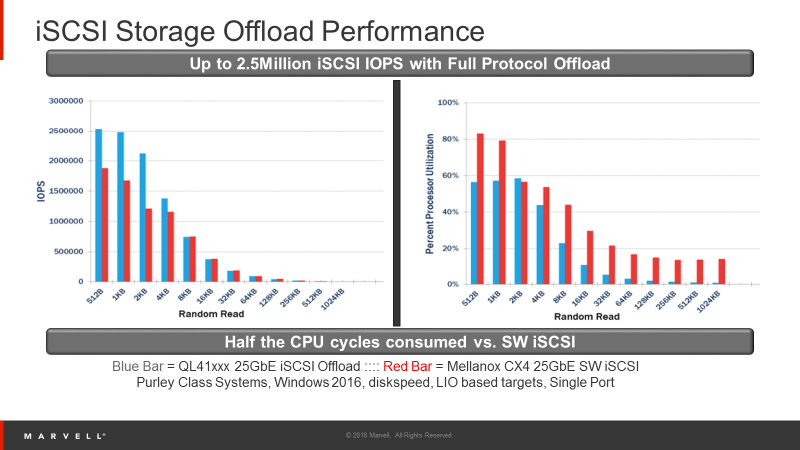 This does add significant networking complexity but will improve the iSCSI performance by reducing the number of interrupts for storage traffic. One additional scenario for these new adapters is in Hyper-Converged Infrastructure (HCI) implementations. 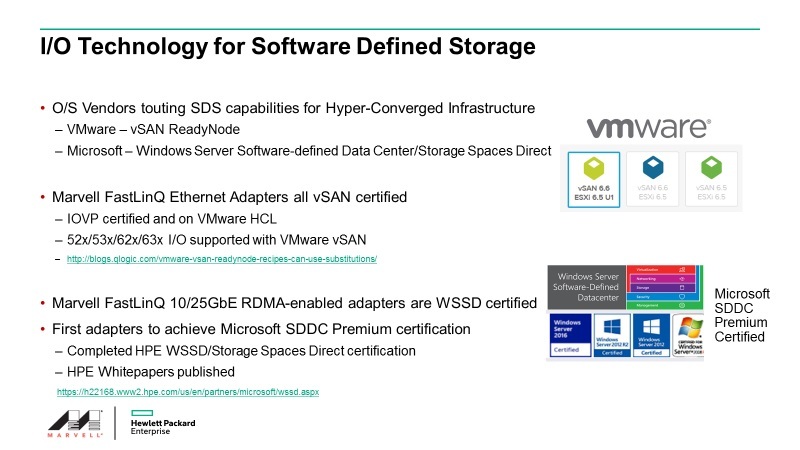 With HCI, software defined storage is used. This means storage within the servers is shared across the network. Common implementations include Windows Storage Spaces Direct (S2D) and VMware vSAN Ready Node deployments. Both the HPE StoreFabric CN1200R BASE-T and CN1300R 10/25GbE CNAs are certified for use in either of these HCI implementations. In summary, the new CNAs from the HPE StoreFabric group provide high performance, low cost connectivity for converged environments. 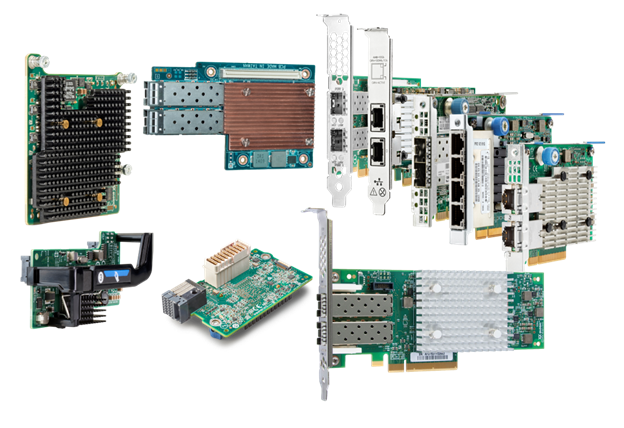 With support for 10Gb and 25Gb Ethernet bandwidths, iWARP and RoCE RDMA and the ability to automatically negotiate changes between 10GbE and 25GbE connections with SmartAN™ technology, these are the ideal I/O connectivity options for small to mid-size server and storage networks. To get the most out over your server investments, choose Marvell FastLinQ Ethernet I/O technology which is engineered from the start with performance, total cost of ownership, flexibility and scalability in mind. For more information on converged networking, contact one our HPE experts in the field to talk through your requirements. Just use the HPE Contact Information link on our HPE Microsite at www.marvell.com/hpe. and Gorka Garcia, Senior Lead Engineer, Marvell Semiconductor, Inc. Thanks to the respective merits of its ARMADA® and OCTEON TX® multi-core processor offerings, Marvell is in a prime position to address a broad spectrum of demanding applications situated at the edge of the network. These applications can serve a multitude of markets that include small business, industrial and enterprise, and will require special technologies like efficient packet processing, machine learning and connectivity to the cloud. As part of its collaboration with Amazon Web Services® (AWS), Marvell will be illustrating the capabilities of edge computing applications through an exciting new demo that will be shown to attendees at Arm TechCon – which is being held at the San Jose Convention Center, October 16th-18th. This demo takes the form of an automated parking lot. An ARMADA processor-based Marvell MACCHIATObin® community board, which integrates the AWS Greengrass® software, is used to serve as an edge compute node. The Marvell edge compute node receives video streams from two cameras that are placed at the entry gate and exit of the parking lot. The ARMADA processor-based compute node runs AWS Greengrass Core; executes two Lambda functions to process the incoming video streams and identify the vehicles entering the garage through their license plates; and subsequently checks whether the vehicles are authorized or unauthorized to enter the parking lot. The first Lambda function will be running Automatic License Plate Recognition (OpenALPR) software and it obtains the license plate number and delivers it together with the gate ID (Entry/Exit) to a Lambda function running on the AWS® cloud that will access a DynamoDB® database. The cloud Lambda function will be responsible for reading the DynamoDB whitelist database and determines if the license plate belongs to an authorized car. This information will be sent back to a second Lambda function on the edge of the network, on the MACCHIATObin board, responsible for managing the parking lot capacity and opening or closing the gate. This Lambda function will be logging the activity in the edge to the AWS Cloud Elasticsearch® service, which works as a backend for Kibana®, an open source data visualization engine. 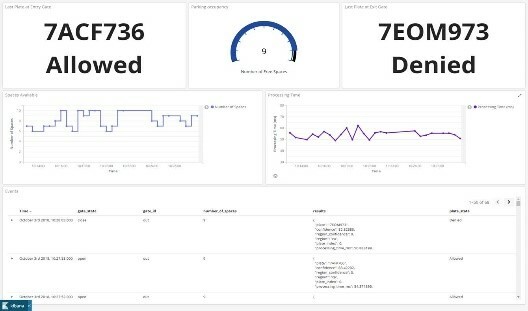 Kibana will enable a remote operative to have direct access to information concerning parking lot occupancy, entry gate status and exit gate status. Furthermore, the AWS Cognito service authenticates users for access to Kibana. After the AWS Cloud Lambda function sends the verdict (allowed/denied) to the second Lambda function running on the MACCHIATObin board, this MACCHIATObin Lambda function will be responsible for communicating with the gate controller, which is comprised of a Marvell ESPRESSObin® board, and is used to open/close the gateway as required. The ESPRESSObin board runs as an AWS Greengrass IoT device that will be responsible for opening the gate according to the information received from the MACCHIATObin board’s second Lambda function. This demo showcases the capabilities to run a machine learning algorithm using AWS Lambda at the edge to make the identification process extremely fast. This is possible through the high performance, low-power Marvell OCTEON TX and ARMADA multi-core processors. 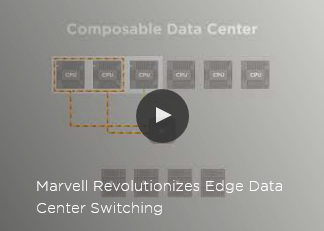 Marvell infrastructure processors’ capabilities have the potential to cover a range of higher-end networking and security applications that can benefit from the maturity of the Arm® ecosystem and the ability to run machine learning in a multi-core environment at the edge of the network. Those visiting the Arm Infrastructure Pavilion (Booth# 216) at Arm TechCon (San Jose Convention Center, October 16th-18th) will be able to see the Marvell Edge Computing demo powered by AWS Greengrass. For information on how to enable AWS Greengrass on Marvell MACCHIATObin and Marvell ESPRESSObin community boards, please visit http://wiki.macchiatobin.net/tiki-index.php?page=AWS+Greengrass+on+MACCHIATObin and http://wiki.espressobin.net/tiki-index.php?page=AWS+Greengrass+on+ESPRESSObin. Infrastructure Powerhouse: Marvell and Cavium become one! Marvell’s acquisition of Cavium closed on July 6th, 2018 and the integration is well under way. Cavium becomes a wholly-owned subsidiary of Marvell. 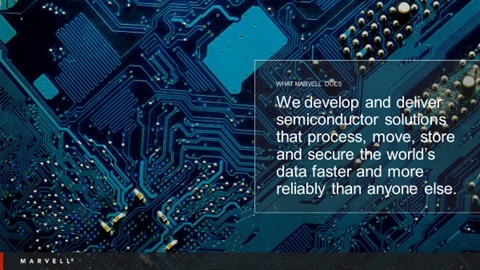 Our combined mission as Marvell is to develop and deliver semiconductor solutions that process, move, store and secure the world’s data faster and more reliably than anyone else. The combination of the two companies makes for an infrastructure powerhouse, serving a variety of customers in the Cloud/Data Center, Enterprise/Campus, Service Providers, SMB/SOHO, Industrial and Automotive industries. For our business with HPE, the first thing you need to know is it is business as usual. The folks you engaged with on I/O and processor technology we provided to HPE before the acquisition are the same you engage with now. Marvell is a leading provider of storage technologies, including ultra-fast read channels, high performance processors and transceivers that are found in the vast majority of hard disk drive (HDD) and solid-state drive (SDD) modules used in HPE ProLiant and HPE Storage products today. Our industry leading QLogic® 8/16/32Gb Fibre Channel and FastLinQ® 10/20/25/50Gb Ethernet I/O technology will continue to provide connectivity for HPE Server and Storage solutions. 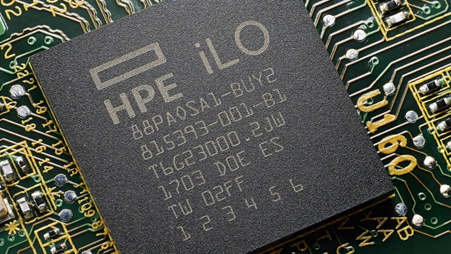 The focus for these products will continue to be the intelligent I/O of choice for HPE, with the performance, flexibility, and reliability we are known for. We will continue to provide ThunderX2® Arm® processor technology for HPC servers like the HPE Apollo 70 for high-performance compute applications. We will also continue to provide Ethernet networking technology that is embedded into HPE Servers and Storage today and Marvell ASIC technology used for the iLO5 baseboard management controller (BMC) in all HPE ProLiant and HPE Synergy Gen10 servers. That sounds great, but what’s going to change over time? The combined company now has a much broader portfolio of technology to help HPE deliver best-in-class solutions at the edge, in the network and in the data center. Marvell has industry-leading switching technology from 1GbE to 100GbE and beyond. This enables us to deliver connectivity from the IoT edge, to the data center and the cloud. Our Intelligent NIC technology provides compression, encryption and more to enable customers to analyze network traffic faster and more intelligently than ever before. Our security solutions and enhanced SoC and Processor capabilities will help our HPE design-in team collaborate with HPE to innovate next-generation server and storage solutions. Down the road, you’ll see a shift in our branding and where you access info over time as well. While our product-specific brands, like ThunderX2 for Arm, or QLogic for Fibre Channel and FastLinQ for Ethernet will remain, many things will transition from Cavium to Marvell. Our web-based resources will start to change as will our email addresses. For example, you can now access our HPE Microsite at www.marvell.com/hpe . Soon, you’ll be able to contact us at “hpesolutions@marvell.com” as well. The collateral you leverage today will be updated over time. In fact, this has already started with updates to our HPE-specific Line Card, our HPE Ethernet Quick Reference Guide, our Fibre Channel Quick Reference Guides and our presentation materials. Updates will continue over the next few months. In summary, we are bigger and better. We are one team that is more focused than ever to help HPE, their partners and customers thrive with world-class technology we can bring to bear. If you want to learn more, engage with us today. Our field contact details are here. We are all excited for this new beginning to make “I/O and Infrastructure Matter!” each and every day.